Not Modern Warfare 4, then? A listing for something called Call of Duty: Ghosts has appeared over at Tesco Direct, dated for release end of December 2013. We'll have more on the subject shortly. In the meantime, check out the boxart below. UK superstore chain Tesco has once again seemingly prematurely leaked information on the next Call of Duty game. The game, expected to be titled 'Call of Duty: Ghosts', thanks in part to an earlier Tesco leak, will be "powerd by a new next-generation Call of Duty engine", according to a new listing which cropped up this weekend. "The franchise that has defined a generation of gaming is set to raise the bar once again with the all-new Call of Duty: Ghosts. Published by Activision and developed by Infinity Ward, the studio that created the original Call of Duty and the seminal Call of Duty: Modern Warfare series, Call of Duty: Ghosts ushers in the next generation of the franchise, delivering a riveting all-new gameplay experience built on an entirely new story, setting and cast, all powered by a new next-generation Call of Duty engine." Activision is yet to confirm platforms for the new game, but the series' typical annual November releases would align this year's game with the launch on Sony and Microsoft's next generation consoles, both of which are expected to go on sale before Christmas. Earlier last week Tesco posted listings for Xbox 360 and PS3 versions of the unannounced game, complete with box art which appeared to be genuine. Additionally, a recently leaked photo of an alleged GameStop 'display blueprint' suggests that the retailer will be receiving new promotional materials related to this year's CoD for display on May 1 - hinting at a public reveal on that date. 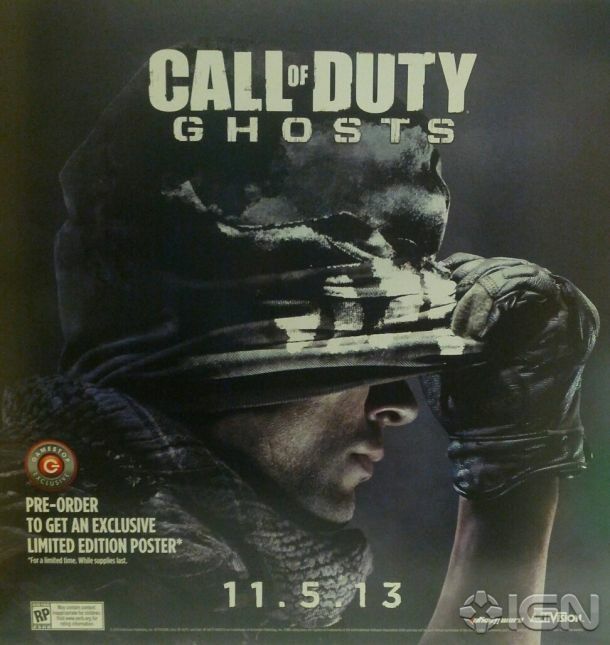 A promotional poster has confirmed that the next title in the Call of Duty franchise is called Call of Duty: Ghosts and that it will be released on November 5, 2013. The poster comes just 24 hours after Activision began teasing the game on its official site and marks our first confirmation of the game's title and release date. The poster confirms previous rumours about Ghosts that first stemmed from a leak via YouTube and shows that box art in recent retailer listings was accurate. So far, information on specific platforms hasn't been released, but expect an official reveal to come on May 1st. Eminem's new track saving the day there. Yeah, CoD is quickly turning into the kind of franchise that has more creativity flowing through their marketing campaigns than their actual products. Looks,well,boring. 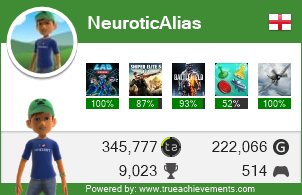 Lost interest in the cod franchise years ago! I still buy them on release day because you can get it for £25 from Tesco knowing that when you've finished it a few hours later Game will give you around £35 trade in for a game you'll actually like. You are one smart cookie! Never really trade anything in. Just in case,you know. This is also where the beauty of rentals falls into play. Which may be where I'll be heading... but definitely not on day one.